This website is entirely dedicated to tensegrities and I hope it contributes a little to all the information about tensegrities that is already out there. Don't expect anything spectucalar because it is everything but complete. In fact I just hope it has the right flavour to get "newcomers" interested in tensegrities and maybe it stimulates those who are already familiar with these structures to broaden their horizon. 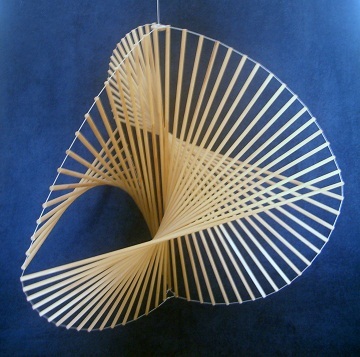 On this page just one picture of a tensegrity for those who haven't the slightest idea what it is. Personally it still strikes me that a few struts and strings can be so fascinating. It must have something to do with all different disciplines that come together in these structures. The design phase demands insight in geometrical three dimensional depth with all its mathematical challenges. After all the thinking it's time for handcraft: the actual sawing of struts and putting and pulling all the components together. In some tensegrities it is fascinating to see that until the last tendon the whole structure is flat on the floor and the struts look like a game of mikado. And with this last tendon two strut ends are connected and a whole structure rises out of nothing... And tensegrities are more. Maybe it is a coincidence but it has an exciting history and, being fascinating structures, they have caused interesting discussions about their practical use in architecture. In fact also some biologists are investigating the role of tensegrities in nature. Is our skeleton some kind of a tensegrity? Are there little tensegrities in every biological cell? It seems that there are more than 2000 articles matching biology and tensegrity. For those who are familiar with a tensegrity and all his aspects, I repeat the words Landolf Rhode wrote to me once: "Lets keep up this communication for ideas and more. The field of tensegrity is huge and not so well-known and there are only few people working on this..."
If you work yourself throught this entire website, I think you may call yourself a "connaiseur" in the field of tensegrities. Because, by that time, I guess there are less than ten thousand people that know more about tensegrities than you do. But you're still not an expert, and I suppose you may not call yourself an expert even after reading everything in all the links that are woven in the text of this site. For that, you should close your computer and start building. Anyway, I wish you a lot of fun with the site, but not after I apologize for my English by starting the same way Valentín Gómez-Jáureguistarts his excellent dissertation about tensegrities: "In the month of September of 1918, James Joyce wrote in a letter: "Writing in English is the most ingenious torture ever devised for sins commited in previous lives."